Lake Erie Monsters rookie left wing Justin Mercier was having trouble focusing at practice earlier this month. Specifically, he kept missing the net with his shots. Afterward, Monsters coach David Quinn called him to his office. Uh-oh, Mercier thought. Quinn asked Mercier what Joe Sacco was going to think the next day when he was practicing with the Avalanche, with Sacco feeding him pucks and Mercier firing wildly? Yeah, that would be bad, Mercier admitted. "I heard the words come out of his mouth," Mercier said. "I didn't know whether to acknowledge them. I still wasn't sure the point of the meeting." The point was that Quinn was trying to have some fun with Mercier in telling him he was going up to the Avalanche to make his NHL debut. Mercier slowly caught on, but didn't actually believe it until Lake Erie GM David Oliver handed him his paperwork. "That was the moment I waited for my whole life," said Mercier, 22. "I was physically holding the itinerary. It's still such a crazy thought in my head." But wait. It gets more improbable. Mercier was getting the recall even though he was goal-less in his first 24 games in Lake Erie. When Nikita Kashirsky of the South Carolina Stingrays sees Alex Ovechkin's success, his boyhood friend is inspires to follow in his path. Would you have believed it, Quinn asked, if I said you'd get promoted a third of the way through the season without lighting the lamp even once? Not a chance, said Mercier. But there he was a day later, skating with the Avalanche the morning of its game against Minnesota. And Mercier's aim had markedly improved. "I think like the first five shots I took I buried in the goalie's chest," he said. That counts as progress, but it's really just a bonus at this point. Mercier's recall goes to show how much he has impressed the organization in doing just about everything else that comprises a valuable role player. "He competes. He plays at a pace. He makes the other team uncomfortable when they have the puck," Quinn said. "There are roles to be filled at that level." 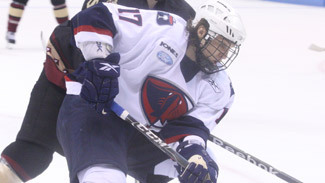 Mercier, a sixth-round pick by Colorado in 2005, stuck with the big club for three games before returning to the Monsters to pursue his first pro marker. Although entering the break he stood at 0-1 in 27 contests, he figures the goals have to start piling up sooner or later. He potted 14 for Miami (Ohio) as a senior last season and 25 as a junior. "As frustrating as it is to not score, I think the most important thing is I'm not a liability on the ice," Mercier said. "I find when I start thinking about it, the rest of my game will go out the window. If you're doing things the right way and following the process, eventually things will work out for you. I've really made it a point to focus on the other areas of my game." That's a philosophy that makes Dale Dunbar smile. Dunbar is Mercier's agent and the former coach of the Erie Otters, who play in Mercier's hometown. Dunbar always pointed out that scoring is just one way to make a difference. "He always stressed to me, 'Justin, are you having an impact on the game?'" Mercier said. "Even if you are a goal-scorer, there are going to be games when you don't score. As I've gotten older, I've realized, what are you doing to make your team better? I don't want it to be easy for (the opposition)." In Quinn's estimation, Mercier's plus-list includes intangibles such as hitting, shot-blocking and blood, sweat and tears on the penalty kill. Quinn has long been a fan of Mercier. When Quinn was an assistant at Boston University, he tried to recruit Mercier there. In a decision that would eventually give Mercier a double-barreled case of torment, Mercier chose Miami. Last year, Quinn's BU team topped Mercier's Miami squad in overtime in the NCAA Division I title game. As the hockey fates would have it, Quinn was named Monsters' coach the same season that Mercier joined the team as a newcomer. Even worse, Mercier's roommate is rookie forward Brandon Yip, who was a foe from that Terriers team. Of course, Mercier and Yip are free to give it to each other back and forth. When Quinn whips out the verbal knife, though, Mercier knows he's best served to hold his tongue. "(Quinn said), you know I'm not going to let you forget about that game the rest of the year, right?" Mercier said. "He's been pretty true to that. There're boundaries there. You don't want to say anything that might make him mad. Ice time is on the line." Quinn said he's been more low-key on the matter. "I've only worn my (championship) ring twice," he said. "I think he's exaggerating a little bit, but I do take a little shot at him." Mercier knows where to go to get a little more respect. During his holiday vacation, he practiced with the youth hockey team of his brother, Dylan. With his newly acquired status as an NHLer still fresh, Mercier was quite the hit. "I try to think of myself at that age. You just realize how much of an impact (you) have,' he said. "When the kids were doing drills, I tried to watch what they were doing, giving them pointers. I made sure the kids are learning the fundamentals." Like putting their shots on net, perhaps, but no one really wanted to dwell on that. One curiosity rose above the others when the youngsters interrogated Mercier about his promotion. It had nothing to do with the fundamentals that funded the trip. "Of course their eyes lit up. The biggest question they had for me was how it was playing against Ovechkin," Mercier said. "I told them it was crazy."